Here’s the latest For the Birds column, which runs weekly in The Hour (Norwalk, Conn.) and The Keene (NH) Sentinel. 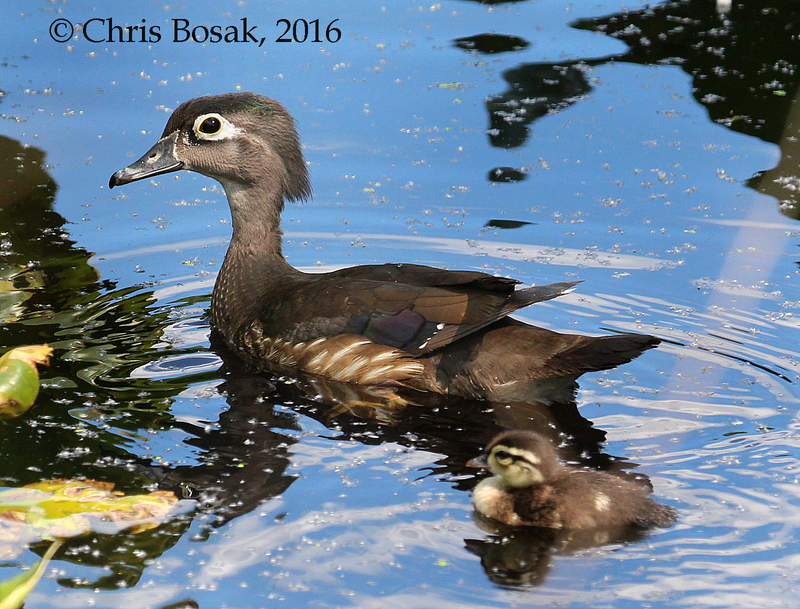 A Wood Duck mother swims with one of her babies at Woods Ponds in Norwalk, Conn., spring 2016. The Mallards were scattered along the grass and I didn’t think twice about it. I’m used to Mallards being tame and not walking away, or even flinching, when someone draws near. With many Mallards, even with babies in tow, they show little or no fear of humans. In fact, many even welcome the approach of humans as the ducks hope to get some food. A Wood Duck mother swims with two of her babies at Woods Ponds in Norwalk, Conn., spring 2016. But in this particular flock of ducks, two females and their babies quickly retreated to the nearby pond. These ducks weren’t Mallards at all, but rather they were Wood Ducks. Two female Wood Ducks and their babies were “hanging out” with the Mallards in the grass near the pond before I pulled into the parking lot. While the Mallards in the group, which consisted of most of the birds, did not even bother to wake up from their midday nap, the Wood Ducks’ instincts told them to retreat. But the scene was still extremely surprising to me. First of all, you don’t always see Wood Ducks hanging out with Mallards. And, second of all, the retreat was slow and had very little urgency to it. Wood Ducks, at least the ones I’ve seen over the years, usually retreat swiftly and deliberately. Without babies, Wood Ducks typically fly away even before people see them. Typically we are left with only the site of them flying away and their “oo-eek” calls following them across the pond. Wood Ducks with babies typically make a silent getaway through the pond vegetation before anybody even notices they are there. But these Wood Ducks were different. It was two females, each with their own brood tagging along. One group of youngsters consisted of fairly large birds, perhaps the equivalent of Wood Duck teenagers. The other group of babies was much younger, still to be considered chicks. Both were cute in their own way. One Wood Duck mother led her brood to the left and one led her brood to the right. The one with the older babies disappeared into the lily pads quickly. The mother with the smaller babies got to the edge of the lily pads and stopped, offering a good view of her and her babies. Wood Ducks are an interesting study in plumage. We think of Wood Ducks as vibrant, colorful, decorative birds. They are perhaps one of the most attractive birds in all of New England. But that is only the male Wood Duck in its breeding plumage, which it sports in the spring and fall. In the summer, it loses that vibrant plumage and becomes a flightless, bland-looking duck. The female, at least from a distance, is always a bland-looking bird. It needs to be that way so it doesn’t attract attention to herself when she is raising young. 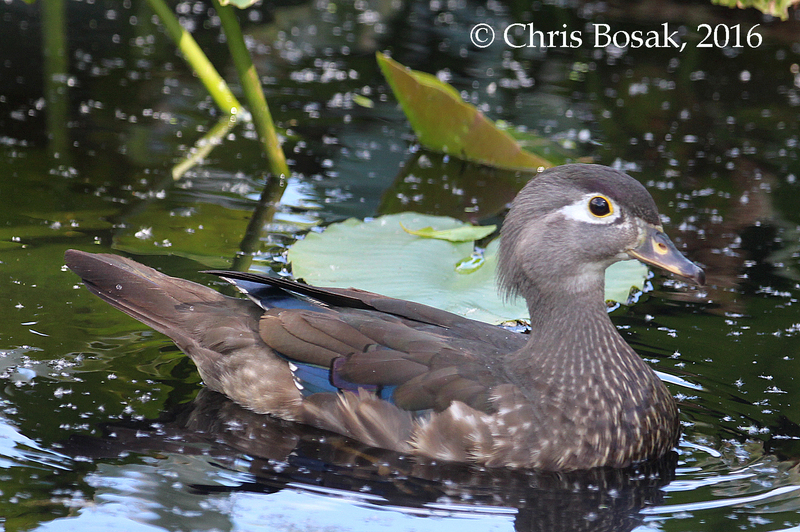 Upon closer inspection, however, the female Wood Duck does show some interesting colors. The plumage sports some blue and purple feathers, and her eye ring, which is surrounded by large white feathers, is yellow. The male has a red eye ring. The babies I saw the other day represented those mothers’ first brood of the spring/summer season. Unlike most ducks, Wood Ducks typically have two broods per season. It was unusual to see these relatively tame Wood Ducks. I hope the babies are safe with this atypical behavior. But who am I to question those mother Wood Ducks? There are many predators lurking in the hiding spots, too, so maybe these mothers feel that mixing in with Mallards in the open is a safer option. If that is what their instincts are telling them to do, then I guess that’s what they should do. For the Birds runs Thursdays in The Hour. Chris Bosak can be reached at bozclark@earthlink.net. Visit his website at http://www.birdsofnewengland.com. A female Wood Duck swims at Woods Ponds in Norwalk, Conn., spring 2016. 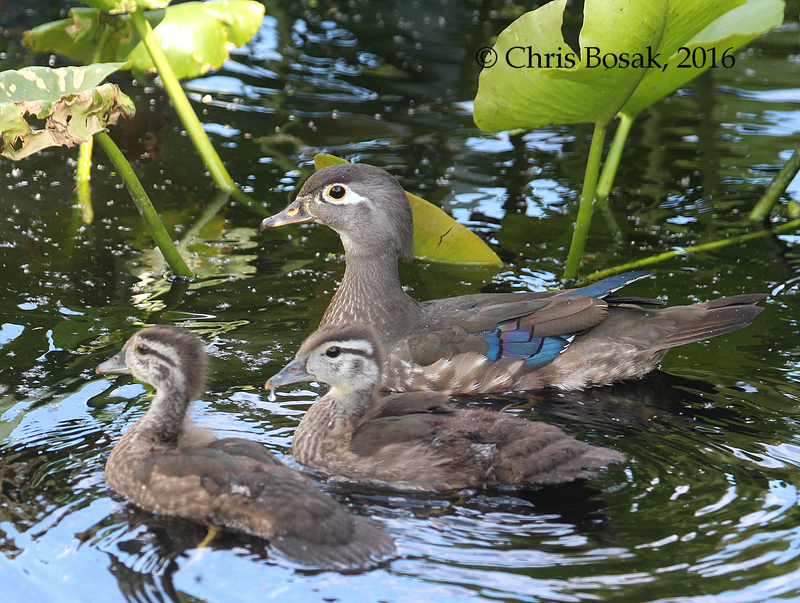 This entry was posted in Baby animals, Bird plumage, chris bosak nature photographer, Ducks, For the Birds column, New England water birds and tagged female wood duck, wood duck babies by Chris Bosak. Bookmark the permalink.